I was given a bean by *Twinkle* last week. I’ve been amazed by the speed with which it’s grown. Anyway, yesterday I decided to film it as I worked and listened to some nice music …and to my amazement, the following happened! Perhaps the first time this kind of activity by a plant has been captured on film? Earlier today I finally managed to post my interview with Arudou Debito, recorded a week or so ago at the Foreign Correspondents Club Japan. It was a lot of work, but well worth it as I learnt a lot in the process of production.First off was the practical stuff: we had an interview room booked at the FCCJ – but it turned out to be totally inappropriate: poorly lit, and with a ventilator that couldn’t be turned off. It might be good for pen and paper interviews, but for anything else it’s pants as it is. Next time I would check out the interview location myself first, and then make sure I took along any lights etc that I needed (I bought some lights last year for photography projects – although only ever used them once (false nails) – oh, and once to light up the sea of cherry blossom in front of our balcony). Next: I need to know my equipment better. One of the cameras was leant to me by a kind friend – but having not used it before it was only when it switched itself off whilst Debito was talking that I discovered that it will stop when files reach 1GB. I also need to make sure I have enough tapes – I forgot to take a spare, and was only saved by the fact that had taken a third (digital) camera along with me. The sound worked out fine. It was recorded using iTalk on the iPhone – what I use for much of our non-studio Japan Podshow stuff. I do need better (semi-pro) equipment. At the moment I only have relatively old household electronics, and although this stuff is only going out on YouTube I believe it does show. Also, working with output from different devices makes editing take forever – I spent the best part of two days editing the Debito interview and outputting it in the various formats. I also need to figure out what happens when I try to put multiple media files in a single WordPress post. I spent hours today trying to sort the RSS feed out, reposting at least 5 times using different plugins and combinations. I apologise to anyone who was spammed by them. Japan Podshow Interview: Arudou Debito from japanpodshow on Vimeo. I need to develop my interview technique. The laughter at the beginning of the interview was totally out of place – we’d been laughing before we began. Also, I need to cut back on the amount of feedback I give – I am getting better at this, tending to nod rather than offering vocal feedback (this was a huge problem in a recording I made for episode 2 of the podcast – the recorded was peppered by my ‘un’s and ‘eh’s and ‘I see’s). I also need to stop saying things like ‘no way!’ and ‘awesome!’ – on recordings at least. I also need to be more conscious about cutting down on ‘um’s and inserting spaces after I have made a mistake for easy editing. I was also too casual in my body language at times. I’m glad I feel able to learn in this public way. I know that if I were a professional producer (and not me) I would want to pull all this stuff offline straight away due to the amateur nature of it all, but I’m not a pro yet, and I am me. …and the best way to learn is to do, right?I want to document my journey – and these first efforts each mark an important step taken towards reaching my goal. I find it interesting that (so far) nearly all of the comments made on my video on the Japan Soc entry are criticisms of Debito. It reminds me of Japan Today, a site I rarely visit these days, where you get hundreds of comments missing the main point of the news story altogether and instead focusing on criticising others for no apparent reason other than to make the comment authors feel superior or ‘right’. I wonder why these people feel the need to criticise him for continuing to raise important issues that few others take the time to raise. It strikes me that these are the kind of people who might claim that non-Japanese in Japan are ‘guests’ and that we have no right to complain! What a load of rubbish! Imagine if all minority groups (such as black people in the US in the early 1950s) had gone along with this twaddle – we’d still have segregated buses! I even found that one of my friends shared this view the other night – I tried hard not to roll my eyes. Anyway, I don’t want to make time to get into that debate here – there’s plenty of other places you can go for that. EDIT: Orchid64 has written a 2-part post on discrimination against foreigners in Japan here – and looks into why some foreigners insist on defending it here. With so little time to blog, The Daily Mumble has suffered. Recent weeks have seen little original content – just repostings of content I’m producing for other outlets. Tonight I was thinking what a shame this was, as I do enjoy writing The Daily Mumble. When do I have regular downtime in which I can write it? Erm, well I’m not usually doing much when I walk home from the station. Typing for those 7 minutes would be a bit tricky though. I’d need some kind of harnness for my MacBook Pro. …or I could just use my iPhone as a voice recorder and turn the Mumble into what it was always destined to be – a literal Daily Mumble. Welcome to The Daily Mumble Podcast. There’s no promises with this, and, as with The Daily Mumble, I’m doing it more for myself than anything else. It’s not meant to attract a huge number of listeners. It’s more just a way in which I can document my life. I’ve updated The Daily Mumble feed so that it’s podcast-compatible, so the feed hasn’t changed from what it was before. It may in due course be available in iTunes too. In this episode I introduce the podcast, talk about being busy & marriage, talk about my debut on today’s metpod (about 25 mins in to the episode) and pass by the local fire brigade practising. 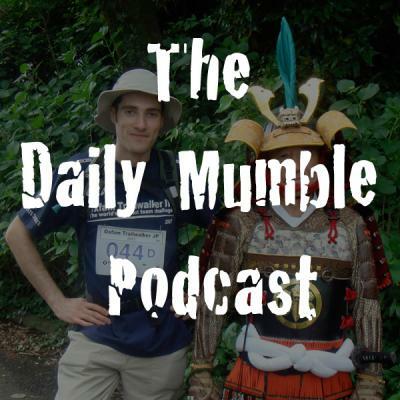 Hhmm, I completely forgot to add Episode 5 of the podcast to The Daily Mumble at the weekend. Silly me. Apologies to those who are also subscribed to my Japan Podshow feeds and get the same content twice (you could just listen to / watch it twice!). Anyway, here’s Episode 5 of the podcast. It’s very silly I know, but also informative and inspiring I think. Check out the interview with http://www.rinkya.com‘s president Heather Russell, and the interview / music from Daniel Edwards. Episode 5 of Japan Podshow is the most musical to date, as George and Joseph invite you in to their Karaoke booth in central Tokyo. Karaoke does of course play a vital part in keeping Japanese society moving, providing an opportunity for stressed out salarymen and swine-flu infected school children to relax and express themselves. Episode 5 also features an interview with Heather Russell, founder and president of http://www.rinkya.com – the fantastic Japan Auction & Online Shopping Service! Heather is a truly inspirational entrepreneur, and over the past 8 years has built www.rinkya.com up to be one of the most popular sites for people wanting to buy things from Japanese sites. Next on the show we introduce the kansai-based Nandeyonen podcast, available from http://nandeyanenyo.podbean.com/. Meet Dr. Foster and Professor Wild! The doctor and the professor are new contributors to Japan Podshow, and will be appearing on a regular basis. In addition to Japan Podshow, you’ll also be able to catch them on Tokyo’s Metropolis Magazine podcast, the Metpod http://www.metpod.com. The professor gives his reaction to some of the stories featured in Metropolis Magazine‘s Small Print section. We then announce the winners of the episode 4 competition to win vouchers on Edufire – the online video learning platform. Congratulations to the winners who correctly identified the secret voice as saying ‘Zenmaisamurai’ and then a few days after release just ‘Samurai’: Perminder Suman, Sylvain vedrenne, Alexandre Coutu, Jeff Smith and Miako Kuran! Check out Edufire today – there’s lessons available 24 hours a day, it’s easy to use, and there’s hundreds of subjects to choose from. If you want to learn Japanese, we recommend Rainbowhill (aka Brett Fyfield), the incredibly popular instructor who featured on Japan Podshow episode 4. …and a very special thank you to Craig and Linda Martin of the Indie Travel Podcast, a fantastic resource for travellers and armchair travellers alike. Check them out! We finish off with an interview and song from Tokyo-based musician Daniel Edwards, a very talented guy whose new single ‘Smile’ (and his entire back catalogue) is now available in iTunes. You can also check Daniel out on MySpace, and become a fan on Facebook. In the US, his single Smile is available from Amazon.com. After the interview we hear “Heaven”, taken from his album “Curtain Call”. There may even be a little bit of bonus material at the end of the show – The show ain’t over till the fat lady sings! We LOVE getting your feedback! Join our Facebook group, skype us, email us, Twitter us (@japanpodshow) – we love hearing from our listeners, please do give us your feedback! Background music in the Small Print section is “Calling from Japan” by Comfortable.